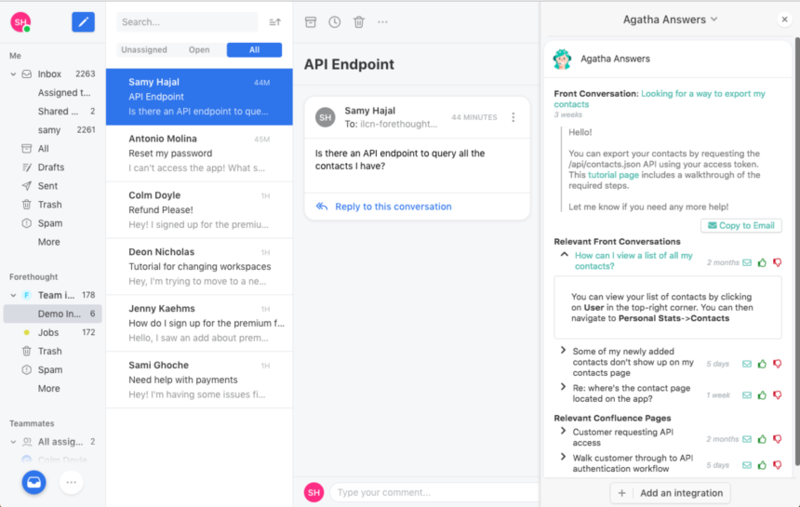 Agatha Answers (developed by Forethought.ai) is an AI-powered teammate that helps customer-facing teams find answers quickly and respond faster — reducing time-to-resolution by 30%. When you enable the Agatha Answers integration in Front, an inbox plugin will be added that scans each open conversation to understand intent. Agatha then automatically pulls relevant information from all your knowledge sources directly into your Front inbox and recommends the best answer. At this time, Agatha Answers must be configured for your team by Forethought and is not available self-serve. If you are interested in trying Agatha Answers, please set up a demo or email the Forethought team directly!